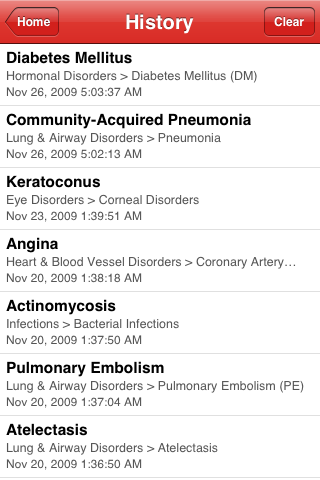 Unlike many applications in the medical section of the App Store, Merck Manual is not made for medical professionals. Instead, the app is aimed at lay people with no healthcare experience. 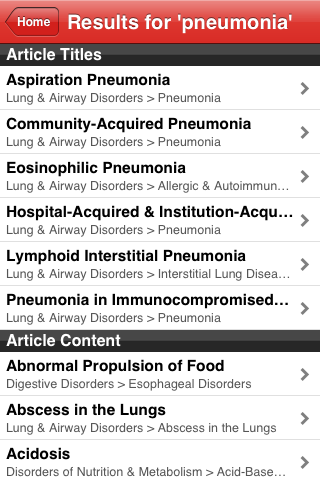 The app hopes to help these people understand medical knowledge easier. We were definitely fans of the Professional Edition, which we recently reviewed. 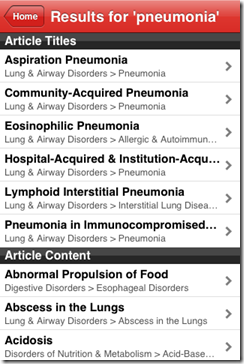 The Professional Edition does a great job with synthesizing the information medical professionals need the most, and basically putting a medical encyclopedia in your hand. I liken the Professional Edition to a Medical Wikipedia, at least in terms of the pertinent content it contains and the feel. The user interface, navigation, and content are beautifully laid out in the Professional Edition, I was hoping to find the same features in the Home Edition as I was preparing for this review. 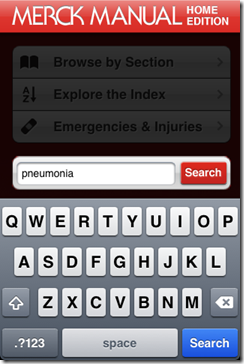 When the home screen opens up you’re presented with four main navigation routes, “Browse by Selection”, “Exploring the Index”, “Emergencies & Injuries”, and “Search”. Unless someone wants to really learn medical knowledge for fun (weird? ), I can’t see people clicking on the Browse by Selection category. Rather, I’m sure the majority of people immediately type in what they are looking for in Search. 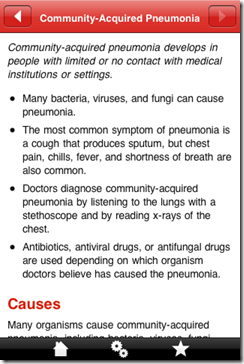 For the purposes of this review I’m going to use pneumonia as an example to look up. 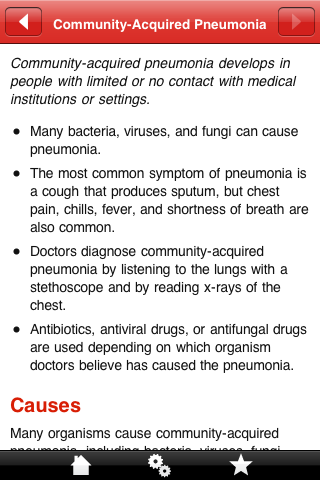 When you type in pneumonia you’re presented with the different types. 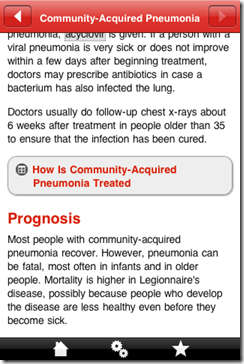 Aspiration, Community Acquired Pneumonia(CAP), and Hospital Acquired Pneumonia(HAP) are the three that stuck out to me as some of the most common. 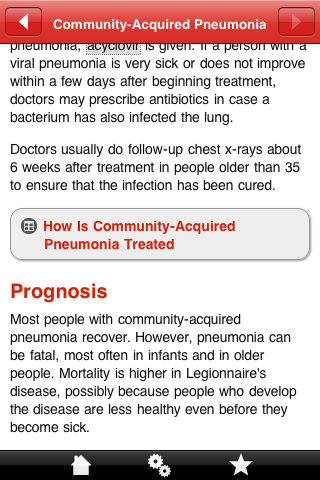 I clicked on Community Acquired Pneumonia as my choice. From there you are given a great blurb about CAP and some high yield information. You are given information about causes, symptoms, diagnosis, treatment, and surprising to me, “prevention”. I was impressed to see this included as one of the subheadings. Prevention is often an after thought when people are looking up different conditions but is definitely essential to know, e.g., you should quit smoking to reduce your chance of getting CAP again. 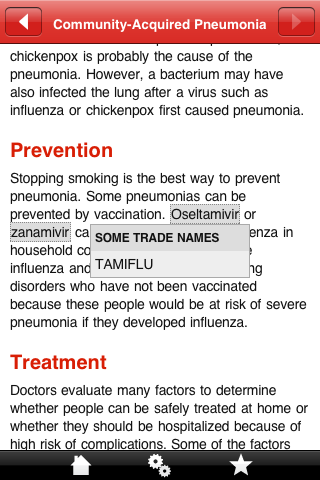 When you’ve located the portion of medical information you actually want to read, such as treatment, and you see a medication listed, this app gives you the option to tap the word and you’re given the generic name of the drug without even having to navigate away from the App. 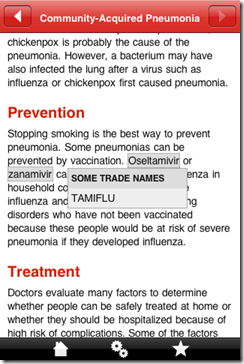 Throughout the text you are presented with hyperlinks of key words, somewhat similar to hw Wikipedia is set up. The fact that you can copy and paste any of the text and even email articles out can be extremely useful. It would be key to use the email function if you have a sick family member and you want the rest of the family to get a better idea of their condition, or if you want to access the information online at a later time. Search feature is essential, yet you have to spell the word absolutely correct to access content in this manner. When I typed in “pneu”, I did not get any results. 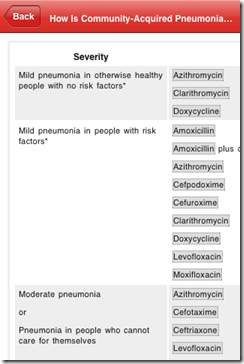 Its easy for me to type pneumonia, I’ve written the word on patients charts hundreds of times, but I could see how this would be annoying to the people the Home Edition is trying to reach. A feature that offers you suggested words when you don’t spell correctly is crucial in this application. Pictures. There are some pictures in this app, but they are definitely not enough. 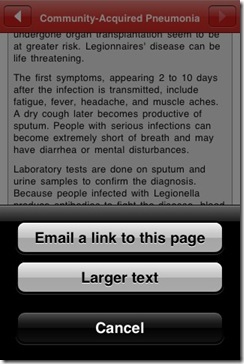 In an app geared towards patients, it would be crucial to have a picture laden application. Overall, I really enjoyed using this application. 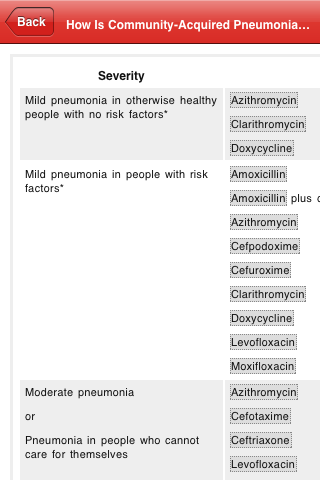 Even thought I’m from the medical side of the world, and I prefer the Professional Edition of the Merck Manual, I can see how non-medical people could find this application very useful. I feel this application’s main competitor is Wikipedia. Both have great content and provide the same sort of key information. Nevertheless, The Merck Manual does have known MDs developing the application, so you can feel little bit more assured about the validity of the content in this application. While reviewing this app, I realized it could be used in the clinic setting as well. 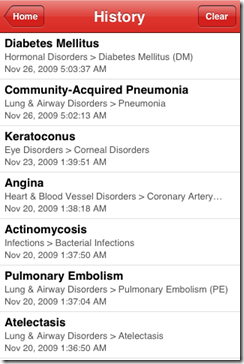 If you have a patient with a known diagnosis, you could give the patient an iPod Touch with this application on there and allow them to use the device to look up key information before the physician walks into the room. This would allow the patient to have a better understanding of their condition, and allow them to ask more advanced and pertinent questions. I still think the physician would need to talk for the same length of time, but the information that is said might be retained better by the patient if they had just read similar information on the mobile device. All in all, if this App is used properly, it could definitely help improve the doctor/patient relationship.